Glo Telecom, always a surprising network that offers cheapest data plan amongst other Telecom Networks in Nigeria. They are here again to surprise their customers with the best call plan soever. Glo Jollific8 Tariff Plan is a newly introduced plan that offers users 800% bonus on any recharge made on new glo SIM card or line. This Jollific8 plan is specially designed to give new Glo prepaid customers a maximum eight times more value on every airtime they recharge using their Glo sim, having that they are already subscribed to the plan. 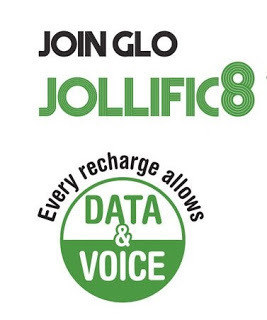 So, because of that, there is no benefit of doubt that Glo Jollific8 plan is one of the best call Tariff at the moment. 3. Allows users to share data to another Glo customer through gift share. 1. You can migrate out of Jollific8 by dialing the migration code of your desired profile. 2. You cannot migrate back to Jollific8 tariff plan once you migrate out of the plan. 3. You will be charged first from your data plan before your "Jollific8 data bonus" account can be charged when you are browsing if you have a glo data plan. 4. If you have credit in your main account, the bonus accounts are charged first and Main account will be charged when the bonus accounts have been fully depleted or expired. With all the details provided above, you should now be convinced that the plan is one of the best sofar comparing other networks tariff plans.